Periyāḻvār occupies a special place among Āḻvārs as he became the father-in-law of Lord Śrī Raṅganātha when his daughter Andal married Him. His Avatāra took place in Srivilliputhur on Svātī Nakṣatra of Tamil Aani month. He is believed to be the amśa of Garuda, the vehicle of Vishnu. Historically he is placed around the later part of 6th century A.D. 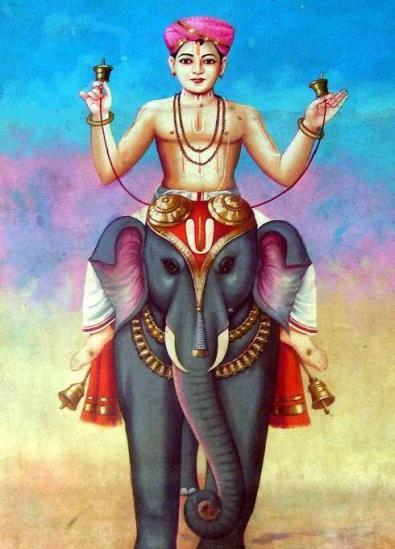 He belonged to a family of devout Vaiṣṇava Brahmins and was named "Viṣṇu-citta". True to his name, his mind dwelt constantly on the form and līlās of the Lord. He did not show much interest in learning scriptures and constantly enjoyed the Lord as little Krishna. He wanted to perform some service of which the Lord would be especially fond of. With this objective, he set up a beautiful garden with great variety of flowers and Tulasī leaves. He used to prepare specially decorated garlands and offered them to the Lord at the "Vatapathra Sāyī" temple. Once, the king of Madurai named Vallabha Deva came to Srivilliputhur in disguise and was going around the villages to know the welfare of his citizens. He saw a brāhmin sleeping on the front porch of a house and stopped to enquire about him. The brāhmin told the king that he was a pilgrim returning south after a tour of many temples in the gangetic plains. for the rainy season when the sun shines. by working hard during the younger days. in this birth to benefit in the next birth." The king was greatly impressed by the śloka and honoured the brāhmin. King's mind dwelt on the futility of his past life and he constantly worried over what is the ultimate reality. He could not choose his faith from the various paths offered by different religions. He called his family preceptor named Selva Nambi and asked him to call scholars and philosophers of various faiths to a contest which will determine the reality. The king tied a big bag of gold coins to a long vertical pole and announced in the contest that the prize will go to the scholar who can bring it down with his faith. For many days, number of scholars tried in vain to do this with their scholarly works, eloquent speeches and heated debates. One night the Lord appeared in Viṣṇu-citta's dream and asked him to go to the king's court and win the contest. Viṣṇu-citta woke up in the morning and proceeded to the king's palace according to the Lord's directive. However he was well aware of his limitations, as he had never shown any interest in scriptural learning. He was confident that the Lord's will always prevail. In the King's court, he proceeded to talk on ‘Śrīman Nārāyaṇa’ as the ultimate reality. The words started flowing as a torrent as he went on quoting the Vedas, the Upanishads and the Purāṇas. Selva Nambi, the king and the entire gathering were thrilled to the core by his conviction in his faith and were astounded to see the bag of coins fall on its own accord into Viṣṇu-citta's palms. The whole court acknowledged that Viṣṇu-citta had the special grace of the Lord. The king honoured him with the title "Bhaṭṭar Pirāṉ". When the Āḻvār came to be called Bhaṭṭar Pirāṉ, one evening, the king took Viṣṇu-citta on a ceremonial parade around the city on his elephant. Śrīman Nārāyaṇa, delighted to see all these honours being showered on the Āḻvār, appeared in the sky on His Garuda Vāhana with Śrī Mahālakṣmī. Viṣṇu-citta was dazed to see the splendour of the Lord and since he always enjoyed Krishna as a child, blessed the Lord with a long life imagining himself as the Lord's mother and sang his "Tiru-Pallāṇḍu" verse. He came to be called "Periyāḻvār" as he thought of himself as elder to the Lord Himself to bless Him. From that day of his victory in the king's court, he started offering garlands of his verses along with floral garlands to the Lord. He has enjoyed Krishna Līlās as much as mother Yaśodā would have done earlier. It is impossible to capture his grace in words other than his own - Periyāḻvār’s "Pallāṇḍu" and "Nīrattam" verses are part of Vaishnava tradition and are recited very often. His verses (461 verses) in the Nālāyira Divya Prabandham are called "Periyāḻvār Tirumoḷi". To Periyāḻvār, the various Avatāras of the Lord are not recollections of the past depicted by the Purāṇas. They are dramas enacted right before his eyes and he bestows a benediction on the Lord for the feats that He performed as Nrisimha, Rāma and Krishna. Once, while he was collecting flowers and Tulasī from his garden, he saw a small baby girl under a Tulasī plant. Periyāḻvār carried this baby home to his wife Vraja. The child had the great fortune of growing up in this family of great bhaktas and turned out to be a great Krishna bhakta, whose experience is unparalleled in history. Even among the Āḻvārs, Godā’s grace surpasses that of all the others. The Jñāna and bhakti came to her at a very young age. Godā pays homage to her father’s influence by referring to herself as "Bhaṭṭar Pirāṉ’s Godā" in all her verses. One can trace a lot of parallels between her verses and those of her father. It is said that Periyāḻvār sang all his verses on the Lords of divya deśas at Godā’s request as she wanted to choose and marry one among them. In his verses, Periyāḻvār refers to his only daughter, her love for Krishna and her later marriage to the Lord.